When we speak of eggs, we're generally talking about the eggs that come from chickens — or hens, to be exact. Without eggs, the culinary arts as we know them wouldn't exist. Eggs are a crucial ingredient in all sorts of culinary preparations from baked goods to sauces. They're also one of the most nutritious and versatile foods in their own right. Large eggs, which weigh an average of 2 ounces each, are the standard, so that's what you should assume if a recipe doesn't specify size. Grading Eggs: Grades AA and A are the only grades that are generally sold to the public, and the difference between the two grades is mainly a function of age. The older an egg, the more it spreads out when broken, the thinner the white is and the flatter the yolk stands. Egg Storage: As long as they're kept refrigerated, you can use eggs up to four weeks past their "sell-by" date. Once they're out of their shells, however, they should be used within a couple of days. Also, their shells are quite porous and strong smells can seep into them. So keep eggs in their cartons rather than in those built-in egg shelves inside some refrigerators. If it sinks and lies flat on the bottom, it's pretty fresh. At three weeks it may stand upright at the bottom of the glass. An egg that floats to the surface shouldn't be used. The "spread test" described above can also be useful in checking freshness. Egg Safety: Raw eggs contain the salmonella bacteria, which can lead to food-borne illness. Wash your hands thoroughly when you handle raw eggs and make sure your eggs are cooked thoroughly. For preparations that contain uncooked egg, such as mayonnaise, use pasteurized eggs, which have been treated with heat to eliminate salmonella. 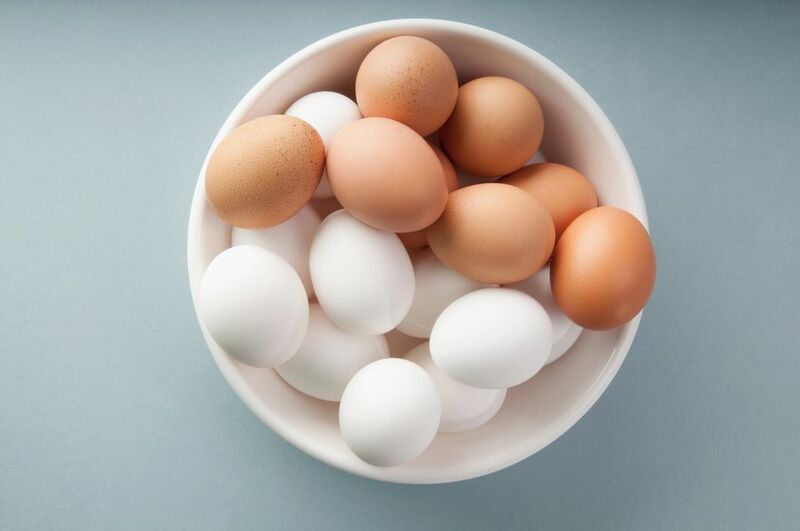 Eggs and Nutrition: Eggs are a nearly complete source of nutrition, rich in protein and iron; they also supply vitamins A, D, E, K, and B-complex. The egg white is high in protein and fat-free. In years past, eggs were thought to be unhealthy because of their cholesterol content. But today, nutritionists agree that the cholesterol in eggs is the "good" kind. And if you've ever wondered whether brown-shelled eggs are better for you than white ones, nutritionally speaking, they're no different. They're just laid by a different breed of hen. Can Plums Be Frozen? Learn How to Select and Store Plums. How Long Will That Fruitcake Last? How Do You Select and Store the Freshest Raisins?